STAR CITIZEN Daymar Rally, Running To The Finish Line - KABALYERO - PLAY, BLOG & EARN! Today, I spent over 7 hours watching a race and this race happened not on Earth but on a moon of another planet in another universe. The universe where this race happened is the Star Citizen universe and it's called the Daymar Rally. I'm not a Star Citizen backer or player so I don't normally search for content about or related to Star Citizen. The only reason why I learned about the Daymar Rally was because of the fact that it appeared in my YouTube's suggested videos. 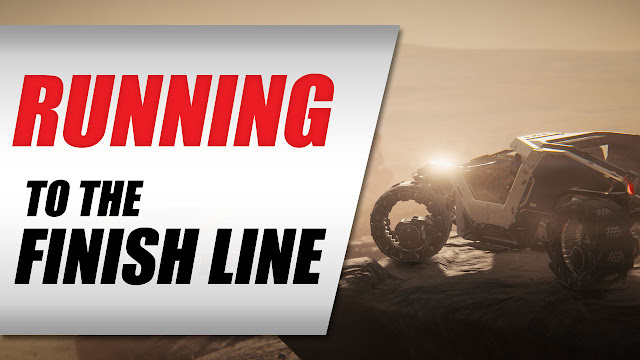 From what I learned from the video, the Daymar Rally is a 300 kilometer race on the moon of Daymar and the race itself is dubbed as the Filthiest Race in the Verse. I'm not really sure why it was called the filthiest race because everything looked shiny and new in the video that I watched in YouTube. Maybe because, many of the participants and even the organizers of the race are filthy rich people? Remember, ships in Star Citizen can cost hundreds to thousands of US dollars but I digress. The Daymar Rally on the moon of Daymar happened on January 27, 2019 and I wasn't able to watch it LIVE but I did get to watch the over 7 hours recorded video of the race in Twitch. The Daymar Rally organizers livestreamed the entire race in their official Twitch channel but the recording of the race that I watched was from the Echelon News 7 Twitch channel. The Echelon News 7 team had a multi-screen setup and their commentaries on what's happening in the race were very entertaining. In my opinion, I think the Echelon News 7 team did a much better job than the official Daymar Rally team in presenting the race. The entire video of the Daymar Rally was over 7 hours long but I was able to watch it from start to finish because the entire event for me was very interesting and it looks like a lot of fun. A lot of things happened in the race like racers blowing up their own vehicles, camera crews getting shot down, etc. but the one that I liked the most was when one racer left his buggy and tried to run to the finish line. I don't know who the racer was but, if I'm not mistaken, he ran for maybe over 2 hours and I was rooting for him to finish. Unfortunately, he didn't finish because he was eventually picked up by a ship and left the race. The Star Citizen's Daymar Rally was a fun event to watch and I had a really good time watching it. I know almost nothing about Star Citizen nor do I know anyone in the rest but I still enjoyed watching it. If you are interested in watching the recorded video of the Daymar Rally then click here. If you have any comments, questions or reactions about this video then please post them in the comments section below.